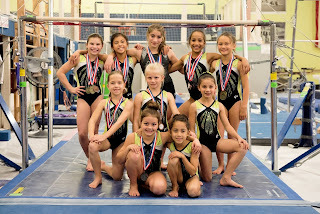 The Level 4 Junior Olympic Team from the Gymnastics Zone competed in the USA Gymnastics Level 4 North State Championships November 7 and 8 at Technique Gymnastics in Rancho Cordova. Those who scored high enough all-around scores during the regular season qualified to compete at this meet and three walked away with State Champion titles in both events and all-arounds to their names. Tatum McKinley – twelfth all-around with a score of 32.525. Coralea Wright – thirteenth all-around with a score of 32.850. Naomi Uemura – third on vault, fifth on bars, first on beam (state champion), third on floor and first all-around (state champion) with a score of 37.000. Emily Tran – fifth on vault, second on bars, third on beam, second on floor and first all-around (state champion) with a score of 37.050. Audrey Jonas – second on vault, ninth on beam and ninth all-around with a score of 35.850. KellyRose Kokotas – seventh on vault and twelfth all-around with a score of 34.350. Fallon Abernathy – ninth on vault, third on bars, eighth on floor and seventh all-around with a score of 35.350. Morgan Phipps – first on vault (state champion), first on bars (state champion), sixth on beam, fourth on floor and first all-around (state champion) with a score of 36.625. Alex Westfall – eighth on vault, sixth on bars, third on floor and eighth all-around with a score of 35.275.